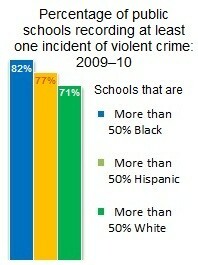 Violence has become a reality at the majority of public schools in America. More than 73% of all public schools in the United States have recorded at least one incident of violent crime during the 2009-2010 school year. These type of crimes include fights, robbery, physical attacks or threats to do so with or without weapons, and sexually related offenses. When only looking at middle and high schools that number increases from 73% to more than 90%. 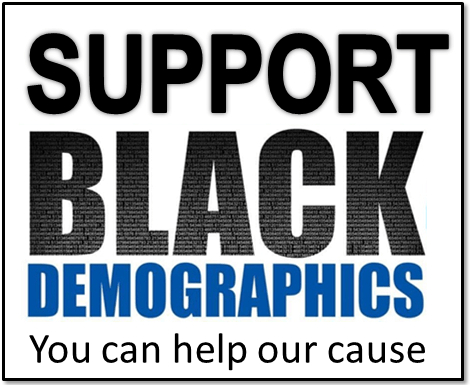 When broken down into racial/ethnic categories, 82 percent of schools that are more than 50% Black have recorded at least one violent crime compared to 77% of majority Hispanic schools and 71% of majority White schools. Although fewer Black schools recorded between 6 and 9 incidents of violent crime than White and Hispanic schools, that changed when comparing schools who have more than 20 recorded incidents of violent crime. In such cases where violent incidents were more frequent 29% of majority Black schools recorded 20 or more incidents compared to 22% of Hispanic and 16% of White schools. 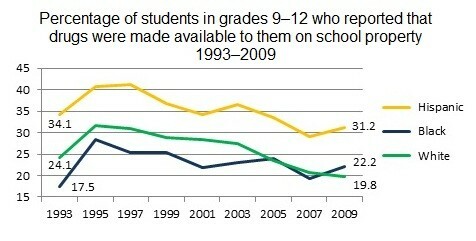 Fortunately the actual presence of weapons and their use in schools are lower. Less than 6% of Black, White, and Hispanic students (Blacks being the lowest of the three at 5.3%) reported carrying a weapon to school. 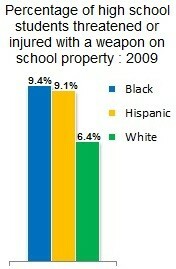 In all racial groups the percentage of students threatened or injured with a weapon on school property is less than 10%. African Americans and Hispanics are about even at 9.4% and 9.1% respectively while 6.4% of Whites in public schools have been threatened or injured with a weapon. When it comes to gangs, Hispanics reported more gang presence in their schools than any other large racial or ethnic group. Gangs, whether or not they are involved in violent or illegal activity, are visible by about one third of Black students ages 12 to 16 in American schools. Whites in the same age group reported 50% less gang presence than African Americans. Urban areas are usually looked upon as the face of gang activity in the United States. However 60% of Black students reported no gang presence at school which includes the school building, on school property, on a school bus, or going to and from school. 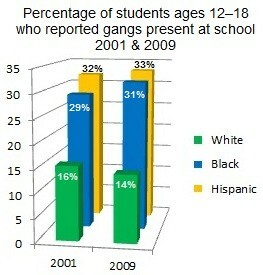 The biggest surprise might be that 35% of Black rural students reported gangs in their schools in 2009. This is a large increase from 22.5% in 2001, while during the same time period reported gang presence in suburban schools by African Americans decreased from 25% to 20%. Overall reported gang presence among all students ages 12 to 18 regardless of race or location remained the same at 20% from 2001 to 2009. Also, 9th and 10 graders reported higher gang presence than all other grades including 11th and 12th graders by a few percentage points over the same 8 year period. Due to factors such as peer pressure, emotional distress, anxiety, and depression, teens are highly susceptible to drug and alcohol experimentation and abuse. Between 1993 and 2008 African American high school students were less likely than Whites and Hispanics to report that drugs were made available to them on school property. Even though this number was higher for African American students than Whites in 2009 it was still much lower than Hispanic high school students during that same year. However, when focusing on only alcohol and marijuana, African Americans were more likely to use than Whites, but less likely than Hispanics.